MASTER PROBLEMS Parenting and Kids How to be a fun dad? How to be a fun dad? Fathers are often completely surprised at the pleasure and enjoyment they receive from playing with their children. The value of such warm, close companionship and fun sharing during a child’s formative years should never be underestimated, for its contributions for good are great. Fatherhood not only calls for love, integrity, courage and knowledge, but also requires a sharing of these qualities daily with those who depend on the father for their future. Obviously, dad cannot be a real father, unless, of course, he is at home in body and mind. When he is, it is then that he is happiest. But what can fathers do to enjoy their children? And where will a hardworking father 'find the time for such activity'? There are 168 hours in a week for each of us. The average man spends about 40 of them at his secular work. Allow another 20 hours for traveling time and lunch. Then set l aside 56 hours, eight each ; night, for sleep. That adds up 4 to 116 hours, which leaves father 52 hours for eating, relaxing, or whatever else he wants to do. Surely in those 52 hours should be able to set aside some time to be with his children. But how many do it? Some father retort, "What can l do ?" l'm too old to play with children." But playing with children is the very thing that keeps a man’s spirit from growing old. And as for things to do, there are aplenty. For example, there are games fathers can play with their children. These can be played during mealtime, at bedtime or on weekends. Some can be played while riding in a car, others while taking a walk. The game “Chain Geography,” for instance, can be played using names of places. A player begins by naming a country, territory, city, sea, river or something similar. The other player then has to come up with another name that starts with the last letter of the preceding word. Children and adults find this game great fun. Another game is one in which a letter is called out and others add to the letter until a word is spelled or they add to it without spelling a word. For instance, father may say H, Junior O, mother L.
Now if sister were to say Y or E or D that would spell a word and she would either win or lose depending on how the game was played. Quiz games are also enjoyable. The children will try to find out what he is thinking, in twenty questions or less. Now father must try to find out what “it” is. The game continues until the other player guesses who he is or gives up. There seems to be a game for every mood and moment. Children enjoy playing checkers and become very adept too. The player tries to get rid of all his checkers as quickly as possible. The first to do so is the winner. Scrabble and anagrams test spelling and vocabulary. Dominoes emphasize number adding and matching. Chinese checkers is a game of jumping but not taking. There are games to play with pencil and paper and games to play with other equipment. Father may not think so, but when junior is sick in bed, a few moments of dad’s attention is some of the best medicine in the world. When visiting with son bring along an old camera or clock and spend a few minutes tinkering with it together. It is always good to spring some new riddle or story or some mental teaser. Children never seem to get enough of these. And if sister is in bed, try putting a jigsaw puzzle together with her or work a simple crossword puzzle. These things mean a lot to children and parents. 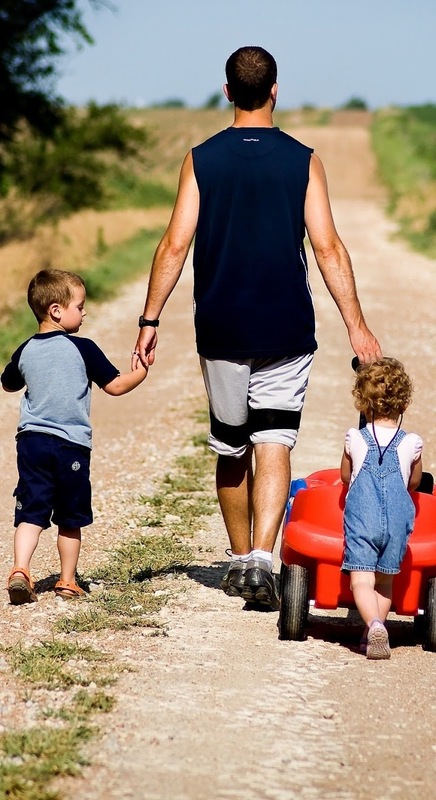 Most children like to play outdoor games with father. Playing catch with a ball, hiking or climbing a hill are always great fun. If you live near the seashore, go shell hunting with your children. Teach them to listen to the surf roll in. Sit in the pitch darkness of the night and thrill at the sight of the moon rise. Observe its silvery reflections and dark shadows. Watch sunrises and sunsets with them. The memory of such scenes, photographed on the child’s mind, will mean more to him in manhood than many hour lectures on nature and good behavior. A child’s world is fresh, new and exciting. Here is a father’s chance to relive and recapture through the eyes of a growing child some of that excitement he once knew. For a child to appreciate and wonder nature it needs the companionship of an adult who is willing to share his knowledge and experience. If a father allows himself this experience he will rediscover a joy often lost to men of age. Exploring nature with your child is deeply rewarding. This is not a huge project; rather, it is a matter of becoming receptive to and aware of what lies around you. For no matter where you live there are clouds and stars, the beauties of the dawn and the twilight. If you train your child to appreciate things through all his senses, you will be keeping your own appreciation alive. The sand grains of the seashore mean more to him if he sees them run through his fingers or looks at them under a magnifying glass. He will not forget moss if he feels its velvety surface. Have him distinguish the different fragrances as he walks with you through the forest. Have him sniff seaweeds, fish and salt water. Train him so he can tell their separate odors. Has he come to appreciate the smell of new mown hay or grass after a warm summer rain? Has he tasted clover blossoms, wild grapes and blackberries? To watch him thrill as you lead him through every new experience of life will bring joy to your heart. Hearing too requires conscious cultivation. Some children pass through life with out hearing the dawn chorus of the birds in the spring. Never let this happen to your children. Wake them up some morning and have them watch with you the daybreak. The experiences of predawn are unforgettable. The soft sounds of the wind, the happy ripple of a brook and the songs of birds are some of the never-to be forgotten sounds. Someday hold your boy’s hand as together you watch a thunderstorm. He will sense your fearlessness and learn courage thereby. When he is around, look at things and speak of them with appreciation and keen interest, and he will learn to wonder and appreciate the world he lives in. In such companionship your child will find joy and you will find inner contentment and a renewed excitement in living. Fathers can enjoy their children indoors as well as outdoors. One way is by teaching them to become collectors of things. Persons who collect things are unusually happy, because they live in so many places; that is, their imagination sweeps the wide world wherever things are found. Some collect stamps and coins, others gather unusual shells, stones, leaves and flowers. Collectors always have something in common to talk about. Can’t you just see Junior’s excitement when he sees father? And away they go happily engrossed in conversation, discussing junior’s recent find. Collections mean display cases and labeling. The cases become filled with a variety of lovely flowers, shells and rocks. Theirs is a miniature family museum. These things will make them think of the places they have visited, things they have seen and the people they have met. The coins and stamps they collect will remind them of faraway people and strange customs. Fathers find delight in teaching children how to grow plants and flowers inside the home. Children thrill in watching things grow. Home aquariums and terrariums never cease to amuse both father and son. Fish and underwater plant life are fascinating to watch. In terrariums pet rabbits and turtles are kept. Vegetable gardens are fine if there is a backyard. Children will take a keen interest in gardening if parents will. Home grown radishes, carrots, peas, beans and tomatoes always add new excitement to the dinner table. Display cases, flower boxes, terrariums and aquariums may also make you want to have a workshop. Designing and creating things for home use are things children never forget. While the workshop is a place of serious business, it is a marvelous place to teach children the value of tools, the need to keep them clean and in their proper places. Junior can help in making snack trays or a bulletin board for the home. Let him observe and help you make a wastepaper basket for the kitchen, or shelves for your cases. Train him so he can make his own pencil holder and magazine rack. Have him assist you whenever possible. His joy will be your great reward. According to your own abilities, you can teach him to work with wood, leather, plastics, cork, aluminum, ceramic clay, cloth or copper. Train him to use a saw, how to hammer, carve and whittle, grind and polish, bake clay, draw and paint. While instructing him your own skills will be kept alive. Yours will be the greater joy for having trained someone you love. But anyplace will never do. Take the children to some specific place that they will remember. While children never seem to tire of zoos and museums, of merry go-rounds and picnics, there is no need to go repeatedly to these places. Why not take them to a paper mill or a newspaper publishing plant on occasion? Let them see firsthand how paper is made and how newspapers are printed. Children like ice cream and chocolate, so why not take them to ice-cream and chocolate factories? A trip to the airport, a tour of an automobile factory, a visit to the city library, will enlarge their appreciation and better equip them for later life. Spend a weekend on a poultry or dairy farm or visit a soda bottling plant. A trip to the courthouse, a few hours at a trial and a tour of the city jail may teach children greater appreciation for law and order. A few hours at a children’s hospital may make them aware of caring for their health and the need to be more careful and sympathetic toward others. Is there a flower festival in town, an auto show, maybe a county or state fair nearby? Any of these would be a joy to children. There is no end of things that can be done without making repeated trips to the zoo or museum or simply watching television. Children love to know what father did when he was their age. How did he have fun? What books did he read? How did he meet mother? They enjoy dad’s getting them ready for bed and his few words with them until they fall asleep. The bedtime custom in many homes is for the father to read a chapter or two of the book aloud to his children before going to bed. Some families sit in a circle. Father will read a page, then mother, then each of the children will take turns in reading. Every now and then the family will have a little songfest of their own. They sing folk songs and some of the old time favorites. Karaoke music, with everybody making gestures to suit the words, is always lots of fun. Sometimes father can watch movies at home with his family. Films are stocked with comedy, nature and instructive shorts on just about any subject you can name. A father’s life does not have to be boring. There are plenty of things for him to do that would add spice to his life, if he would but reach out and do them. They are essential foods for a happy family life. For some of the most profound satisfactions in a father’s life arise, not so much from his success in the business world as from his being truly a father to his children.